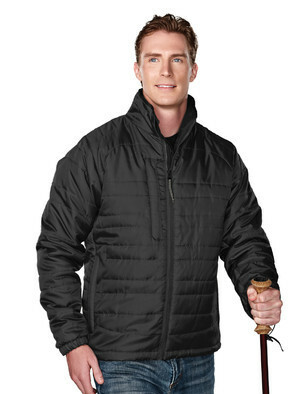 Description: The Brooklyn jacket features a windproof/water resistant mini-ripstop nylon shell with a 4.5 oz. synthetic microfiber quilted lining, creating a great warmth-to-weight ratio. Features a charcoal brushed tricot inner collar, and an adjustable open bottom drop tail hem and elastic cuffs for a custom fit. Plenty of room for storage with zippered side pockets, and outer and inner chest pockets. Quilted panels specifically designed with decoration location in mind.